term insurance – CorePlan Financial Inc.
May 1, 2018 /in Business Owners, Families, Individuals, life insurance, permanent insurance, term insurance /by CorePlan Financial Inc.
You most likely do, but the more important question is, ‘What kind?’ Whether you’re a young professional starting out, a devoted parent or a successful CEO, securing a life insurance policy is probably one of the most important decisions you will have to make in your adult life. Most people would agree that having financial safety nets in place is a good way to make sure that your loved ones will be taken care of when you pass away. Insurance can also help support your financial obligations and even take care of your estate liabilities. The tricky part, however, is figuring out what kind of life insurance best suits your goals and needs. This quick guide will help you decide what life insurance policy is best for you, depending on who needs to benefit from it and how long you’ll need it. Life insurance can be classified into two principal types: permanent or term. Both have different strengths and weaknesses, depending on what you aim to achieve with your life insurance policy. Term life insurance provides death benefits for a limited amount of time, usually for a fixed number of years. Let’s say you get a 30-year term. This means you’ll only pay for each year of those 30 years. If you die before the 30-year period, then your beneficiaries shall receive the death benefits they are entitled to. After the period, the insurance shall expire. You will no longer need to pay premiums, and your beneficiaries will no longer be entitled to any benefits. The family breadwinner. Death benefits will replace your income for the years that you will have been working, in order to support your family’s needs. A stay-at-home parent. You can set your insurance policy term to cover the years that your child will need financial support, especially for things that you would normally provide as a stay-at-home parent, such as childcare services. A divorced parent. Insurance can cover the cost of child support, and the term can be set depending on how long you need to make support payments. A mortgagor. If you are a homeowner with a mortgage, you can set up your term insurance to cover the years that you have to make payments. This way, your family won’t have to worry about losing their home. A debtor with a co-signed debt. If you have credit card debt or student loans, a term life insurance policy can cover your debt payments. The term can be set to run for the duration of the payments. A business owner. If you’re a business owner, you may need either a term or permanent life insurance, depending on your needs. If you’re primarily concerned with paying off business debts, then a term life insurance may be your best option. …Have a special needs child. As a special needs child will most likely need support for health care and other expenses even as they enter adulthood. Your permanent life insurance can provide them with death benefits any time within their lifetime. …Want to leave something for your loved ones. Regardless of your net worth, permanent life insurance will make sure that your beneficiaries receive what they are entitled to. If you have a high net worth, permanent life insurance can take care of estate taxes. Otherwise, they will still get even a small inheritance through death benefits. …Want to make sure that your funeral expenses are covered. Final expense insurance can provide coverage for funeral expenses for smaller premiums. …Have maximized your retirement plans. As permanent life insurance may also come with a savings component, this can also be used to help you out during retirement. …Own a business. As mentioned earlier, business owners may need either permanent or term, depending on their needs. A permanent insurance policy can help pay off estate taxes, so that the successors can inherit the business worry-free. Different people have different financial needs, so there is no one-sized-fits-all approach to choosing the right insurance policy for you. Talk to us now, and find out how a permanent or term life insurance can best give you security and peace of mind. 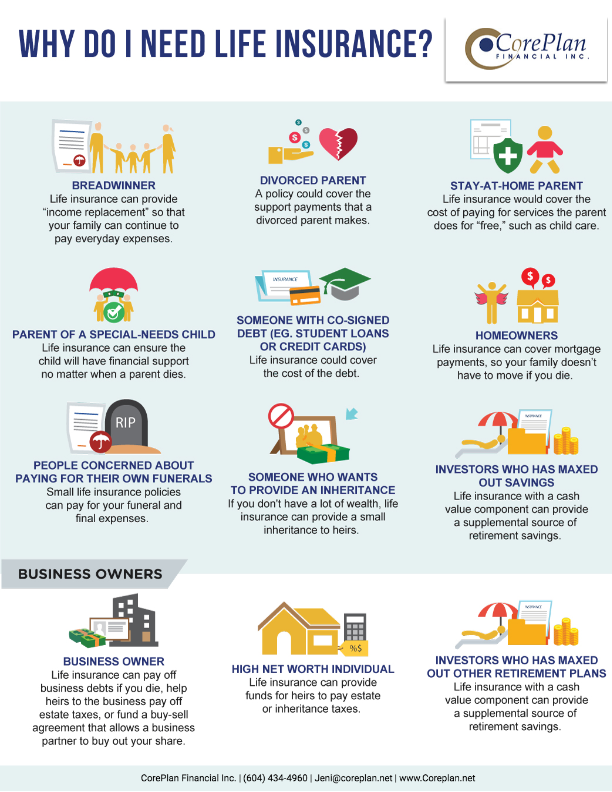 http://coreplan.net/wp-content/uploads/2018/05/featuredImage-Do_you_really_need_life_insurance.png 800 800 CorePlan Financial Inc. http://coreplan.net/wp-content/uploads/2018/06/dualLogo3.jpg CorePlan Financial Inc.2018-05-01 19:32:002018-05-16 19:39:30Do you REALLY need life insurance? By providing your email address, you provide us with your express consent to send you commercial electronic messages related to finances and/or investments that may be of interest to you. Should you wish to discontinue receiving emails of this nature, you may contact us at jeni@coreplan.net to withdraw your consent at any time. 600A - 5945 Kathleen Ave.
2 – 11116 100th Ave.